Sometimes when I make a vegetarian dish that is so pretty my carnivore has to admit it looks good - even if he would never touch it. 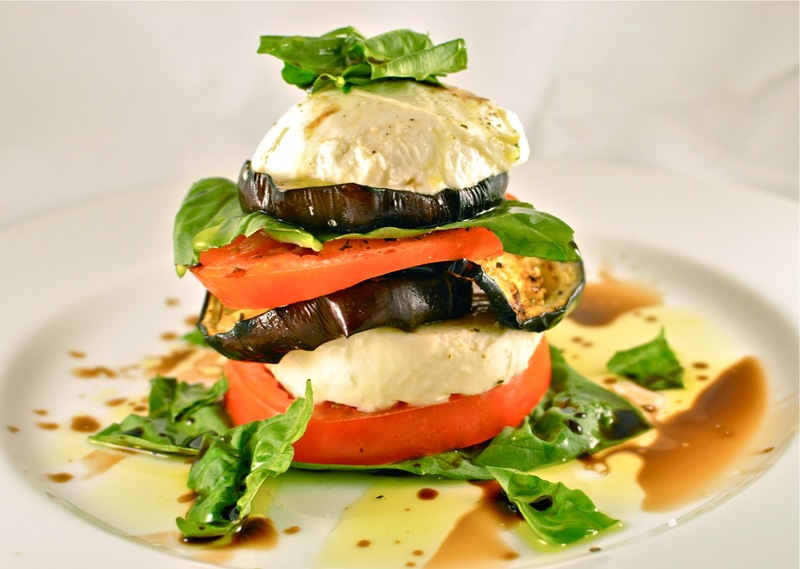 This stacked eggplant beauty is just that sort of thing. Now, when the carnivore has our grill out and going for his steak or chicken or whatever meat he is is enjoying for dinner, I always take advantage of him...or rather his agreeableness to add something on the fire for me. Sometimes this is simply a side dish, like corn or potatoes. Sometimes it means grilled fruit for dessert, pineapples or peaches maybe. Other times, I con him into making my main dish too. On this occasion I had my man make me grilled eggplant. You can find out just how he makes this mouthwatering veggie by clicking here. While he cooked the eggplant, I sliced a beefsteak tomato and fresh mozzarella into hefty chunks. I also gathered some basil from my herb garden. Once the eggplant was ready, I started stacking the ingredients. I then topped the tower with cracked pepper, kosher salt, a drizzle of olive oil, and a few dashes of balsamic vinegar. It was not only nice to look at, this grilled eggplant dish was delicious too. A fresh bit of summer stacked in a pretty pile on my plate. Even the carnivore commented on it...as he chewed his steak. This may be kind of a weird question, but what lighting source do you use? I bought a light tent awhile back but I can't seem to get it bright enough to look right with my white background. Thanks a million! I have a light box tht I light with two small desk lamps. I then do some editing in iPhoto to make it brighter if needed. I also take pics during the afternoon sometimes on a table in my bright kitchen with lots of indirect sunlight. I sy just keep taking lots of pics. It's the only way to improve. Hope that helps! This does look delicious. I would love this over a hamburger. I came here via Honest Cooking. I'll be contributing soon from Texas and I'm looking at articles others have written. Thanks!